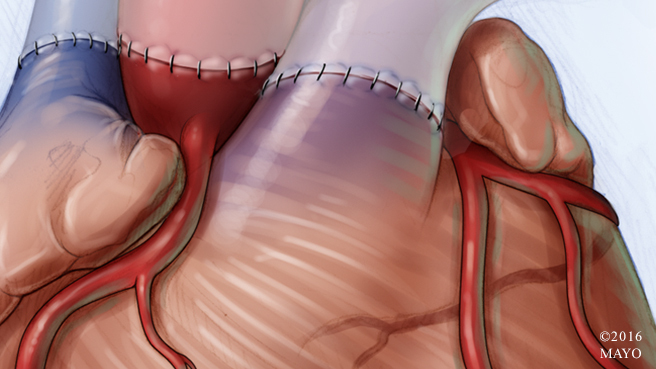 A simple line of sutures remains as a new heart replaces a failing one. As a science writer, I’m typically juggling a recorder, a note pad and a pen. Sometimes a camera. Today, the heart I held in my hand was warm and firm, red and healthy-looking. And beating. In my hand. Just an hour earlier it was in the body of a 110 pound pig. Over the next few hours I’ll watch as Christopher Livia, an M.D.-Ph.D. student, his summer student Scott Rohren and Tyra Witt, veterinary technician, get a cold, dead heart to beat again. This work in the Behfar laboratory is part of the Van Cleve Cardiac Regenerative Medicine Program’s initiative to increase the number of available hearts for transplantation. The first heart transplant was performed in 1967 on a grocer from Cape Town, South Africa. While the patient, Louis Washkansky, only lived 18 days, the surgery emboldened other medical centers. Advances in immunology and the discovery of the anti-rejection medication cyclosporine in 1976, made transplantation a real option for those in need. When the cart with the pig heart is wheeled into the lab, it’s ex vivo as they say—outside the body. The heart chills in an icy liquid that keeps it paralyzed. This solution, developed by Livia, stills the beating of the heart and provides electrolytes to keep those cardiac cells happy during the extraction. Clamps are peeking out of the top of the jar, keeping air out of the heart. “Just like a blood clot, air would cause the heart muscle to die in that area,” explains Livia, a student in the M.D.-Ph.D. medical scientist training program, a joint offering from Mayo Medical School and Mayo Graduate School. He lifts the heart out of the slushy liquid and starts trimming. It’s cold slippery work. But then they need to clean it up. All they need is the heart and part of the aorta—that’s where the heart will be connected to the pump and tubing that mimics circulation within the body. Christopher Livia trimming tissue from the heart. What is that, I ask? I will forever look at bendy straws differently I reply. “Yeah, so did I,” he says. After a year of perfecting the set-up and variables for this procedure, Livia and his team are about to embark on a structured series of experiments to see if a dead heart can be awoken and the damage of death mitigated. In the first decades of heart transplantation, few patients survived longer than five years. But today about 75 percent of transplant patients survive for that long. And according to the United Network for Organ Sharing, heart transplants have made up a 9.6 percent slice of the total transplant pie, or about 64,085 surgeries over the last 28 years. But that pool of donors is far smaller than the list of recipients. Because here’s the thing—the heart doesn’t need a green light from the brain. It will begin to contract spontaneously under the right conditions. Now that the cold heart is free of other body tissue and blood, it’s ready to be attached to the set-up that mimics the body’s circulatory system, called a Langendorff system. In this case, the set-up consists of two large and six small glass containers, two pumps, tubing, clamps, valves, a heater and electric leads which can be used in a variety of combinations. Langendorff systems have been used to test the effects of drugs on the heart, electrical conduction, the effect of genetic mutations, and myriad of other types of investigations. Instead of blood, the system is using a solution that provides the heart with everything it needs. “It has all the same stuff that’s in your blood that you would need to keep muscle and tissue alive, without the cells,” he says. “So it has glucose, it has your electrolytes, it’s at the right pH…” The liquid is also heated and gassed with pure oxygen to feed the muscle. The pumps mimic the types of pressures you’d experience in your arteries and veins. But before the pig heart is attached to the system, all the air bubbles must be out. Livia taps glass, lifts tubing, and flicks containers, trying to get the air bubbles to the travel up to a container called the “aortic bubble trap” (sadly, it’s just a glass vessel with a great name). Scott, who is working in the lab before returning to school at Texas A&M University in the fall, helps look for air bubbles in the tubing. This is, he says, much more interesting than his last job summer job (life guarding). He means in general— learning to set up the Langendorff, how to do western blot tests to detect proteins and genetic modification using E. coli, but considering life guarding, bubbles may well be more interesting, too. The Langendorff looks good and ready so they place the connector into the aorta of the heart and start the pumps. “Is that bubble in the coil fine?” asks Scott. It doesn’t reach the heart though so it’s an easy fix. More clamping, flicking of tubes and the heart is out of danger. “Scott, keep watching for those bubbles,” says Livia. Throughout the experiment he has been unfailingly polite and considerate of his team. Despite the need to quickly prepare the heart to preserve its function, Livia has calmly explained the experiment to me, and pointed out the finer details to his team while responding to general lab questions from other lab mates. The liquid begins to gently flow into the heart. The top of the heart, the atria, are indeed beginning to pump. Both Livia and Tyra assure me that once the heart warms up it will be more vigorous. “You can get gloves and touch it if you want,” he says. The heart feels like the muscle it is, sort of like a chicken breast. It’s firm but yielding (“When it gets rigid and stiff you know it’s completely dead,” notes Livia). It’s warm and fits easily in my hand. But although the atria at the top are pumping, the ventricles at the bottom are just shivering. Livia decides to shock the heart to get the ventricles into rhythm. After a defibrillator malfunction (fixed—no joke—by unplugging it and then plugging it back in), and two 50 joule shocks, the ventricles of the heart start to beat. Everyone gathers to watch.